ANGE Postecoglou has named a preliminary 30-man squad for the Confederations Cup, Brazil friendly and all-important World Cup Qualifier against Saudi Arabia in Adelaide on Thursday, June 8. 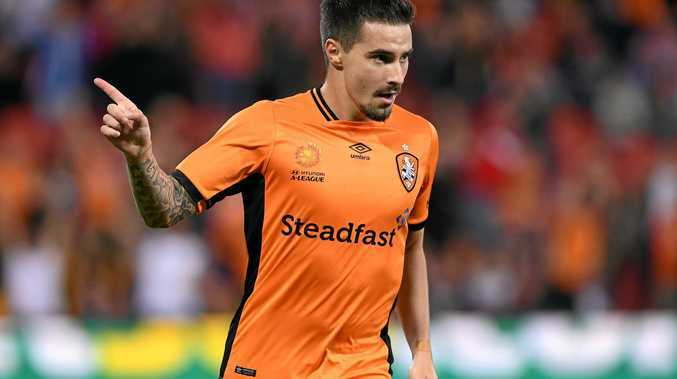 A-League Golden Boot winner Jamie Maclaren has been recalled, just days after announcing his move to German club SV Darmstadt, while Postecoglou has named unknown Dutch-based winger Ajdin Hrustic, who was reportedly locked in an international tug-of-war with interest from Bosnia and Herzegovina. The 20-year-old, who has played just seven times for Gronigen in Holland, moved from Schalke two years ago. Tom Rogic returns from injury after a positive end to the season with Celtic, but Rhys Williams, fresh from his move from Perth Glory to Melbourne Victory that was made with Socceroos ambitions as a reason, has been dropped from the last squad. Robbie Kruse remains in the frame despite being without a club and much game time in 2017, after his sudden departure from Liaoning Whowin, but Matthew Spiranovic once again misses out due to long term injury at Chinese second division club Hangzhou Greentown. Dylan McGowan joins his brother Ryan in the squad, capping a memorable week for the former Adelaide United defender after he sealed a move to Portuguese club Pacos Ferreira. It is the first set of brothers in a senior Socceroos squad since 2008, when Adam and Joel Griffiths were named in a Pim Verbeek squad. The extended group will be culled to 23 next Wednesday ahead of the vital clash at Adelaide Oval, glamour friendly against Brazil on Tuesday, June 13 and then the Confederations Cup tournament in Russia, where Australia has been drawn with Germany, Chile and Cameroon. The side currently sits third in qualifying for the 2018 World Cup in Russia and plays Saudi Arabia, currently alongside Japan in the automatic qualifying positions, three points ahead of Australia in the group qualifying table. After the Confederations Cup, Australia has qualifiers away in Japan and at home against Thailand to round out the quest for Russia. If the Socceroos remain third, the side would have to play-off against third in Asia's Group A - currently Uzbekistan, with the winner of that home-and-away series to face the fifth placed finisher in North and Central America, currently Honduras, trailing USA only on goal difference.